It was a great tournament by both Josephine Lee and Vince Mai as they represented Canada brilliantly at the 2012 World Cup in Warilla Australia the past two weeks. Josephine finished the tournament with a 5-5 record narrowly missing the playoffs. Two of her 5 wins came against World Ranked players. Val Smith from New Zealand who is ranked #3 and Australian powerhouse Karen Murphy who is #4 on the World list. If not for a few close tie-break games Jo was right there. On the men’s side it was another great showing for Vince Mai. What a lot of people don’t know is Vince suffered a heart attack a month before getting on the plane and heading over to Australia. It took 5 days of playing until someone finally took Vince down and that was in a close tie-break game against last years Champion. With a good quarterfinal win Vince found himself in a familiar spot having to play last years champ once again to make the finals. 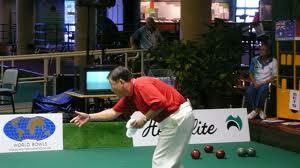 In 2010, Vince lost a close game to Leif Selby to make it through to the big stage. So in two tries at the World Cup he has made it to the semi finals and come home with two Bronze Medals – great job Vince on representing your Country and playing to your potential. Congrats to both Josephine and Vince – thanks for your putting in your time and doing us all proud.